Ireland’s most famous writing is probably the stunningly detailed illuminated script of the Book of Kells, but long before the monks set about creating it, Ireland had an entirely different form of writing – ogham script. 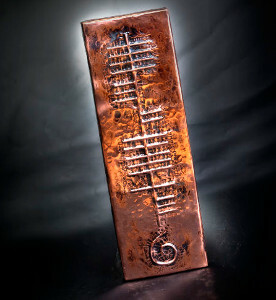 Ogham is the oldest form of writing used in Ireland; it dates back to the fifth century AD. While it is now seen on all sorts of Irish gifts, it was originally carved on stone. Standing stones carved with ogham script have been found throughout Ireland and even in parts of Wales where the ancient Irish settled. A few have also been found in England and Scotland. County Cork can boast the most of these fascinating artifacts, and University College Cork has the largest display of them open to the public in Ireland. Visitors to Cork can drop by the Stories in Stone exhibition in the Main Quadrangle Building on the UCC campus and take a stroll back in time through the Stone Corridor, and admission is free. Ogham script looks nothing like any of the writing systems commonly used around the world today. It is both primitive and complicated. Ogham was carved on standing stones and read from the bottom to the top. It is a system of lines carved against a single vertical line in the center. The lines are either horizontal or at an angle. There are 20 characters, and they are named for trees. The ogham alphabet includes, for example, the characters dair (oak) and coll (hazel). The origins of the ogham script remain a mystery debated by scholars. While some believe ogham dates back to the Druids, who venerated trees, most think it is not quite that old. One theory is that ogham was developed to be cryptic to keep invaders from understanding it, while another theory holds that the script was created by early Christians to spread their message. Scholars do know that it was used for poetry and to record names, and it is considered evidence that Ireland has always been a land of saints and scholars. Today ogham is making a comeback. You won’t find it on street signs or books, but it is increasingly popular on Irish gifts such as pendants, rings, wall hangings and picture frames. It lends itself to short inscriptions such as names and short phrases. It’s become a popular Irish gift to celebrate the arrival of a child, especially on a photo frame so the baby’s picture is next to his or her name written in ogham script. Ireland has always been celebrated for the written word. Irish literature from the Tain Bo Cuailnge (The Cattle Raid of Cooley) to James Joyce’s Ulysses to Roddy Doyle’s The Barrytown Trilogy is studied and enjoyed around the world. It isn’t just the content of our writing that has captivated people around the world. The aesthetic beauty of The Book of Kells and the ancient Ogham script have drawn admiration from every part of the globe as well. www.irishshop.com One of the first online retailers in Ireland. Selling Irish Gifts to the US, Canada and worldwide since 1997. Over 2000 products available including Irish and Celtic Jewelry, Clothing, Coat of Arms and Family Crests, Personalized Irish Gifts, Irish Pub decor and much more. Working with top Irish brands such as Solvar Jewelry, Belleek Potter, Guinness, Carraig Donn, Mulligar Pewter and Jimmy Hourihan Capes.